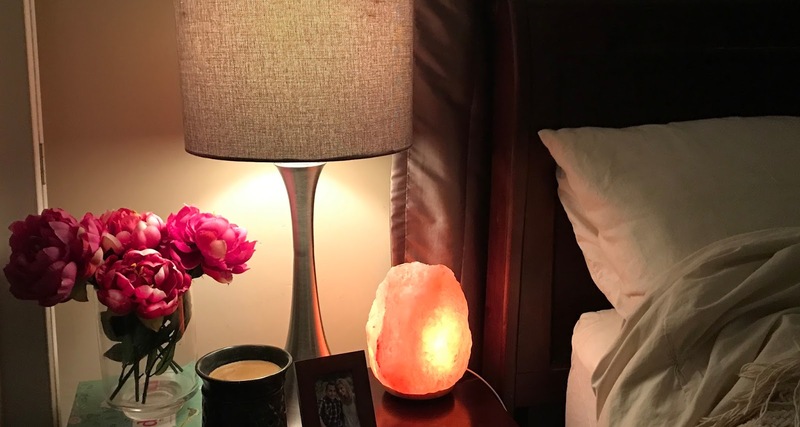 So, it seems that the new, trendy thing in health and decor these days is Himalayan Salt Lamps. Have you heard of them? I've been seeing them all over lately, both in the stores and online. We first saw them last summer in Colorado. Some of the gift shops had them. I had never really seen them before then and didn't pay too much attention to them at the time. But lately I've been hearing so much about them and all of the amazing things they're supposed to do! So, I had to see for myself. I actually ended up buying one from The Vitamin Shoppe. 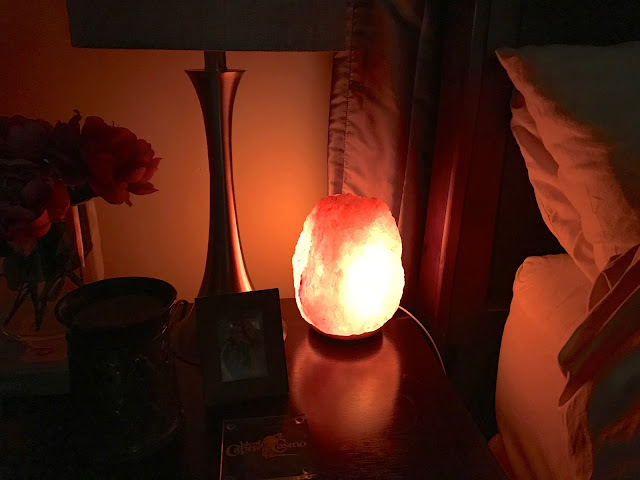 I saw a lot of good things online about the WBM brand lamps, and the reviews were really great for this one. 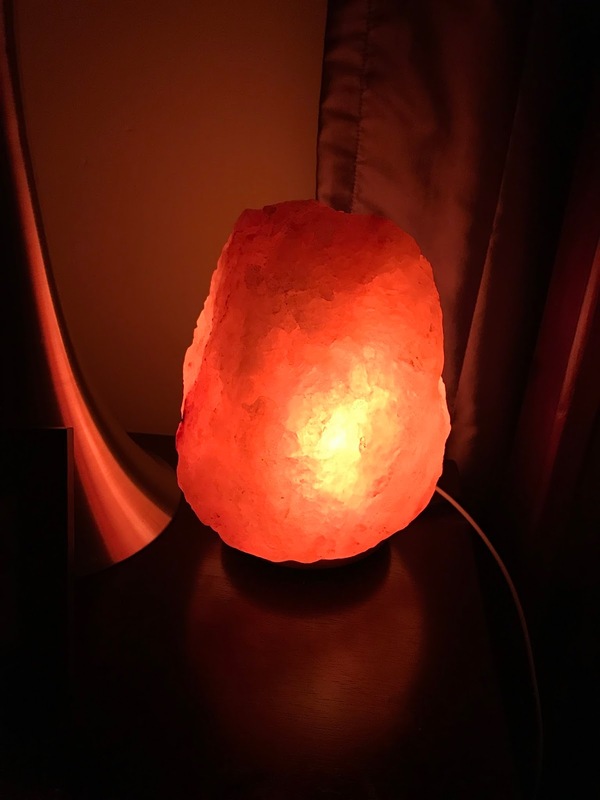 It's 100% natural and hand-carved Himalayan salt, so each one is unique. 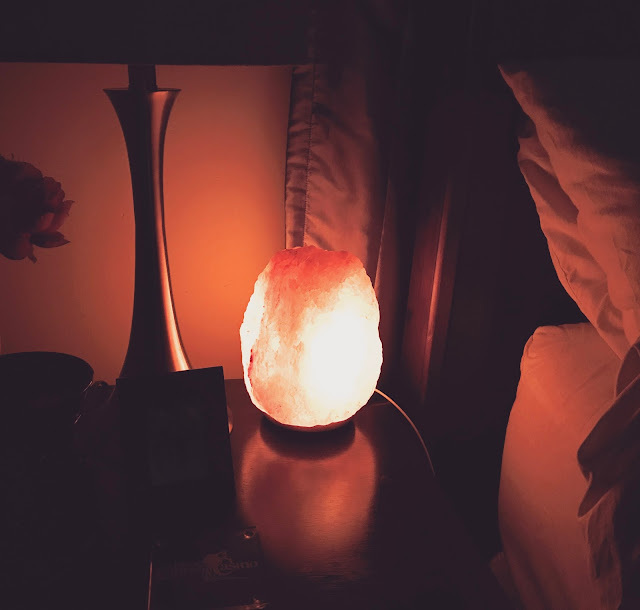 I've had my lamp for a little over a week now, and I really love it. From what I've read about Himalayan salt lamps, when you turn the lamp on, the light activates the salt, which acts as a natural air purifier, and cleanses the air by releasing negative ions. These ions "cancel out" toxins in the air, and the effect is something similar to the pure air at the top of a waterfall. The main reason I decided to get one was for the reported health benefits, and to see if it would improve my allergies. I mainly just get them during allergy season, so I haven't had an issue with them yet this year. But I can say that the air does feel "cleaner" to me now, and I love the warm glow that it gives off. It's kind of calming in a way. I replaced my alarm clock that I never used in the bedroom and have it on my nightstand. This lamp has a dimmer, so I've been sleeping with the light on dim. It's a much better energy now than with my alarm clock there, and I feel like it's less dusty, too! So all in all, I'm definitely loving my new lamp so far. I'd say that they're worth all of the hype just for the warm and pretty glow they give off! And I wouldn't mind getting another one to enjoy when I'm not sleeping, too. Maybe I'll give an update in 6 months or so and share what I have or haven't seen in terms of health benefits over time. Stay tuned! We purchased one a little over a month ago - waiting to see if will help with my allergies this spring.